Download "Explore commands on the ribbon Each ribbon tab has groups, and each group has a set of related commands." 1 Quick Start Guide Microsoft Excel 2013 looks different from previous versions, so we created this guide to help you minimize the learning curve. Add commands to the Quick Access Toolbar Keep favorite commands and buttons visible, even when you hide the ribbon. Explore commands on the ribbon Each ribbon tab has groups, and each group has a set of related commands. Show or hide the ribbon Click Ribbon Display Options or press Ctrl+F1 to hide or show the ribbon. Manage files Open, save, print and share your files. Also change options and account settings in this view. Access other tabs More tabs appear on the ribbon when you need them, like chart or PivotTable tabs. Get visual cues Watch for action buttons that appear in the sheet and animations that show data changes. Create sheets Start with one sheet and add more sheets as needed. Show shortcut menus Get in the habit of right-clicking your sheet, chart, or PivotTable data. Excel will show you commands that are relevant for your data. Open a dialog box Click the launcher icon to show more options for a group. Show Key Tips If you d rather use the keyboard, press Alt to show keys that let you access commands on the ribbon. And yes the keyboard shortcuts you ve used before will still work. Change views Work faster in the right view. Choose Normal, Page Layout, or Page Break Preview. Zoom in or out Drag the zoom slider to change the zoom level. 2 How to get started with Excel 2013 If you ve been using Excel 2007 or 2010 and are familiar with the ribbon, you ll want to know what changed in Excel If you ve been using Excel 2003, you ll want to know where to find the Excel 2003 commands and toolbar buttons on the ribbon. We have many free resources to help you learn Excel 2013, including online training. Just click the question mark in the top-right corner above the ribbon to open Excel Help. Explore the ribbon If you ve used the ribbon in an earlier version of Excel, you ll notice a few changes. The Insert tab has new buttons to help you create charts and PivotTables. There s also a new Filters group with buttons for creating slicers and timelines. Other tabs appear when you re working on certain things like charts and PivotTables. Those tabs have also changed to make things easier to find. 3 Things you might be looking for Use the list below to find some of the more common tools and commands in Excel To... Click... And then look in the... Create, open, save, print, share, or export files, or change options File Backstage view (click the commands in the left pane). Format, insert, delete, edit or find data in cells, columns, and rows Home Number, Styles, Cells, and Editing groups. Create tables, charts, sparklines, reports, slicers, and hyperlinks Insert Tables, Charts, Sparklines, Filters, and Links groups. Set page margins, page breaks, print areas, or sheet options Page Layout Page Setup, Scale to Fit, and Sheet Options groups. Find functions, define names, or troubleshoot formulas Formulas Function Library, Defined Names, and Formula Auditing groups. Import or connect to data, sort and filter data, validate data, flash fill values, or perform a what-if analysis Data Get External Data, Connections, Sort & Filter, and Data Tools groups. Check spelling, review and revise, and protect a sheet or workbook Review Proofing, Comments, and Changes groups. Change workbook views, arrange windows, freeze panes, and record macros View Workbook Views, Window, and Macros groups. 4 Apply features without the ribbon In Excel 2013, we ve placed some frequently used but hard to find commands and buttons within easy reach. Better access to chart features Creating a recommended chart is great way to get started, but you ll still want to customize the style and show the exact data you need to make it your own. Excel 2013 gives you these options right next to the chart. Just click the Chart Elements, Chart Styles, or Chart Filters buttons to fine-tune your chart. When you select data on your worksheet, the Quick Analysis button appears. It gives you quick access to many useful features you may not have been aware of, and lets you preview them on your data before you make them stick. When entering data, you might notice that Excel fills values automatically as it detects a pattern. You ll get the Flash Fill Options button to make further decisions. 5 How to work with people who don t yet have Excel 2013 Here are some of the things to keep in mind when sharing or exchanging files with people who are using an older version of Excel. In Excel 2013 What happens? What should I do? You open a workbook that was created with Excel Excel opens the workbook in compatibility mode and keeps it in Excel file format (*.xls). When you save the workbook, Excel will tell you about compatibility issues if you ve used new features that aren t supported in earlier versions of Excel. Keep working in compatibility mode if you re sharing the workbook with people who don t have Excel If you re not sharing the workbook, convert it to the Excel file format (*.xlsx) to take advantage of all new Excel 2013 features (click File > Info > Convert). You save your workbook as an Excel 2013 file. Excel saves the workbook in the Excel file format (*.xlsx) so you can take advantage of all new Excel 2013 features. If you plan to share this workbook with people who use an earlier version of Excel, check the workbook for compatibility issues (click File > Info > Check for Issues). You can then see the issues and resolve them before you share the workbook. You save your workbook as an Excel file. Excel automatically checks the file for compatibility issues and shows them for any new Excel 2013 feature you used. Assess any compatibility issues and resolve them before you share the workbook. 6 Find advanced features To record an occasional macro, you can use the Macros button on the View tab. 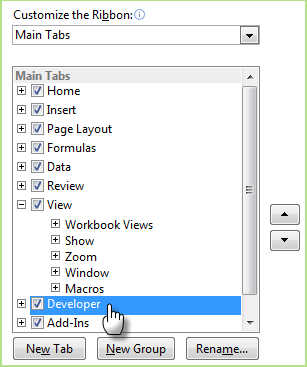 But if you plan to routinely create or edit macros and forms, or use XML or VBA solutions, you ll want to add the Developer tab to the ribbon. You can select it on the Customize tab of the Excel Options dialog box (click File > Options > Customize Ribbon). Enable add-ins that come with Excel Excel 2013 comes with several add-in programs that let you do some advanced data analysis. There are common Excel add-ins, such as the Analysis ToolPak or the Solver add-in. Enabling add-ins adds them to the ribbon. Just select them in the Manage box on the Add-ins tab of the Excel Options dialog box (click File > Options > Add-ins), and then click Go. The Developer tab appears on the ribbon to the right of the View tab. If you have a Professional Plus version of Office, you ll also have some new add-ins, such as the Inquire, PowerPivot for Excel 2013, or Power View add-in. The Power View add-in even has a designated button on the Insert tab. Clicking that button the first time enables the add-in. Quick Start Guide. Microsoft Access 2013 looks different from previous versions, so we created this guide to help you minimize the learning curve. Quick Start Guide. Microsoft Visio 2013 looks different from previous versions, so we created this guide to help you minimize the learning curve. Microsoft Excel 2010 Training Microsoft Excel 101 Instructor: Debbie Minnerly Course goals Find popular commands quickly on the ribbon. Learn how to use the File menu (Microsoft Office Backstage view).